The bee and the hive have long been symbols of industry and regeneration, wisdom and obedience, with a place in Egyption, Roman and Christian symbolism. 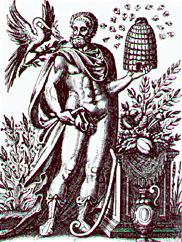 The hive is often seen in Masonic illustrations of the 18th and 19th century and both Clovis and Napoleon adopted the bee as their symbol. Although "the bee was among the Egyptians the symbol of an obedient people, because, says Horapollo, 'of all insects, the bee alone had a king. '1, its use in Freemasonry was secondary to any number of other symbols based on the working tools of a stone mason. "Looking at the regulated labor of these insects when congregated in their hive, it is not surprising that a beehive should have been deemed an appropriate emblem of systematized industry. Freemasonry has therefore adopted the beehive as a symbol of industry, a virtue taught in the instructions, which says that a Master Mason 'works that he may receive wages, the better to support himself and family, and contribute to the relief of a worthy, distressed brother, his widow and orphans...' The ark has already been shown to have been an emblem common to Freemasonry and the Ancient Mysteries, as a symbol of regeneration - of the second birth from death to life. Now, in the Mysteries, a hive was a type of the ark. 'Hence,' says Faber (Origin of Pagan Idolatry, volume ii, page 133), 'both the diluvian priestess and the regenerated souls were called bees; hence, bees were feigned to be produced from the carcass of a cow, which also symbolized the ark; and hence, as the great father was esteemed an infernal god, honey was much used both in funeral rites and in the Mysteries. This extract is from the article on the bee in Evans' Animal Symbolism in Ecclesiastical Architecture."2. "Honey is used to illustrate moral teachings. A man is exhorted to eat honey and the honey comb (Pr 24/13), but warned against surfeit (Pr 25/16.27). It was a simile for moral sweetness (Ezk 3/3), and for the excellence of the law (Ps 19/10), of pleasant words (Pr 16/24), and of the lips (Ca 4/11), and as a figure of love (Ca 5/1). The LXX adds to Pr 6/8 'Go to the bee, and learn how diligent she is, and what a noble work she produces; whose labour kings and private men use for their health. She is desired and honoured by all, and, though weak in strength, yet since she values wisdom she prevails.' This quote exists in the Arabic version, and is quoted by ancient writers." 3. That the newly converted Clovis would use a bee as his symbol is not surprising. It aligned him with the Christian Roman Empire without alienating those of his subjects who still maintained non-trinitarian or pagan sympathies. Napoleon was initiated, passed and raised into an Army Philadelphe Lodge of the Ecossais Primitive Rite of Narbonne between 1795 and 1798.4. Considering Napoleons interest in things Egyptian, his reason for adoption of the bee symbol can only be a subject of supposition. When Napoleon had embroidered bees sewn on his robes it was not as a claim of legitimacy directed at any of his contemporaries; certainly not the aristocracy whose roots were not Merovingian nor sympathies masonic. Certainly not the freemason revolutionaries of the USA who were then embracing republicanism. The bee is a symbol of systematized industry, an obedient people and of rebirth. It is easier to accept that the Merovingians, freemasons and Napoleon found their way to the symbol by their own path than it is to create a convulated and undocumented connection between them as some conspiracy theorists have tried. "The bee hive is an emblem of industry, and recommends the practice of that virtue of all created beings, from the highest sereph in heaven, to the lowest reptile of the dust. It teaches us, that as we came into the world rational and intelligent beings, so we should ever be industrious ones; never sitting down contented while our fellow-creatures around us are in want, when it is in our power to relieve them, without inconvenience to ourselves. When we take a survey of nature, we view man, in his infancy, more helpless and indigent than the brutal creation: he lies languishing for days, months, and years, totally incapable of providing sustenance for himself, of guarding against the attack of the wild beasts of the field, or sheltering himself from the inclemencies of the weather. It might have pleased the Great Creator of heaven and earth, to have made man independent of all other beings; but, as dependence is one of the strongest bonds of society, mankind were made dependent on each other for protection and security, as they thereby enjoy better opportunities of fulfilling the duties of reciprocal love and friendship. Thus was man formed for social and active life, the noblest part of the work of God; and he that will so demean himself, as not to be endeavouring to add to the common stock of knowledge and understanding, may be deemed a drone in the hive of nature, a useless member of society, and unworthy of our protection as masons.5.